Bennett Brinson Gamel: Fighting Cystic Fibrosis: A new medication for Bennett? 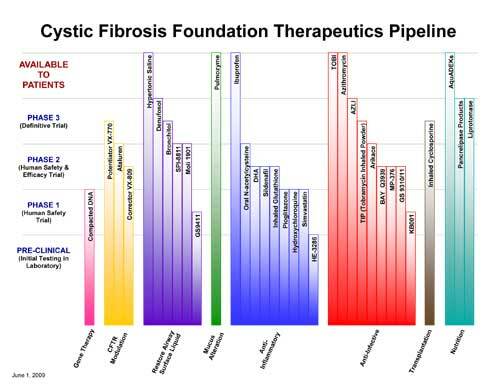 One of my favorite things the CF Foundation provides for families of those suffering from CF is the CF Pipeline. 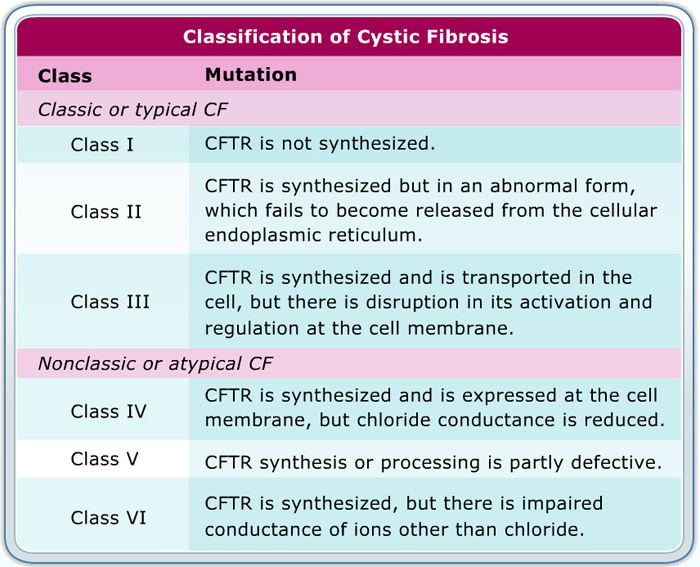 The "CF Pipeline" is a like a guide of what medications are currently being researched and where they are with regards to being available for Cystic Fibrosis patients. It makes it very easy for families to see which medications are "coming down the pipeline." This is an old pipeline image but this is similar to what currently exists. For an up-to-date pipeline, go to the most current form on the Cystic Fibrosis website. At this point, there are around 25 different medications in the pipeline. Some medications are for keeping lungs healthy. Other meds are to improve digestion. There are a few medications to counteract lung infections. But some, the most hopeful of them all, are those that are showing signs they can treat the underlying issue in Cystic Fibrosis. I have known about the CF Drug Pipeline since we first learned Bennett had CF. But I haven't been all that interested in it as I haven't felt like it mattered much to us. This all changed most recently when a CF Mama who has a young girl with the same genetic mutation as Bennett mentioned to me that her daughter (and therefore, my son) might benefit from this new medication called, Ataluren. In order to have Cystic Fibrosis, one must have two genes that do not work properly. There are 1800 different mutations that have been identified as not working properly. 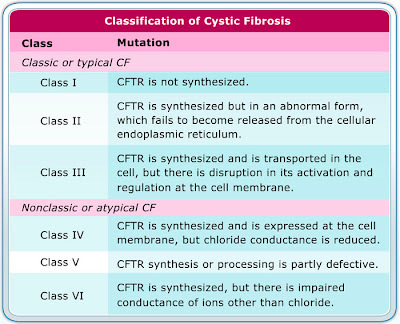 Any combination of two of these can show up as being Cystic Fibrosis in a person. I was surprised when my friend mentioned Ataluren might help Bennett and her daughter Savannah. I had not heard much about Ataluren and what I had heard was that it helps those mutations "that end with an x". Neither of Bennett's mutations end with an "x". But following my friends' lead, I went searching for more information about Ataluren and what I learned was Ataluren helps those with Class I mutations. 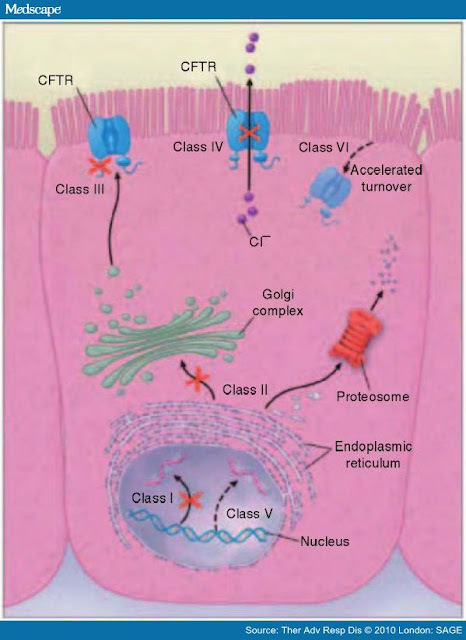 Of the 1800 CF mutations that exist, each is categorized by class. Each class indicates the place where the gene is malfunctioning. At this point, scientists have identified five different areas of gene malfunction. This is important because, as scientists discover more about what is malfunctioning in the gene, scientists are more likely to figure out how to solve the problem. By classifying mutations, medications can be identified to help the problem. This is the case for the new medication Kalydeco. It was discovered that Kalydeco can significantly improve the malfunctioning of the gene for those Class III genes. This is why only 4% of those with Cystic Fibrosis have benefited...because one must have CF due to this specific malfunction in order to benefit. Ataluren looks to be benefiting those whose malfunction is happening in the area of Class I (premature stop codons in the mRNA). And, to my surprise, when I did some research, my friend was so right! Her daughter and Bennett may very well benefit from Ataluren as they both have the gene mutation 621+1G->T which is a Class I mutation. I spoke with Bennett's doctor about it last week and she agrees we have a reason to be hopeful. So, what does this mean for Bennett? First, we don't know for sure if Ataluren is going to help Bennett or Savannah. But, from what we have read from the research so far, we do not see why it would not be somewhat beneficial to them as they suffer from a Class I CF mutation. Second, we don't know if Ataluren is ever going to make it to public use. But we do know that it is currently in Phase 3 Clinical Trials, one step away from being approved by the FDA. Third, we don't know the results of the Phase 3 Clinic Trials and how affective the drug is. There has been some talk of side effects on the liver. And it hasn't been thought to be quite as successful as Kalydeco. But we have heard good things and believe we should know the results of the Clinic Trials by the end of the summer. Fourth, we don't know what it will mean even if Ataluren does help Bennett and Savannah, does make it to public use and does show effectiveness. All we know is we have reason to be hopeful. Only about 10% of those with CF have a Class I nonsense mutation like Bennett has. So, like Kalydeco, this means that Ataluren may directly affect only a small portion of people with CF. However, like is the case with Kalydeco, there is suspension that, if beneficial, Ataluren might be given in addition to other drugs in the pipeline as an effort to help many more people with this disease benefit. I have other thoughts to share in the future. But for now, it's worth noting that I am cautiously optimistic that Bennett may benefit from a drug that looks like it may help. And when living with a disease known to take one's life, any optimism is much appreciated. I'll post more on this drug as it becomes available. You have such a gift! Your writing is fabulous. This was a well written and informative post. I learned something new today so thank you! I look forward to future posts on the status of Ataluren. So many hopeful things in the works for our kiddos! I was super healthy until after college and I believe a lot of the decline had to do with the fact I QUIT exercising. The best thing you can do for him is to get him in peewee soccer as soon as possible and keep him in activities where he will run. Also, cut down on sugar and processed food...an anti-inflammatory diet changed my life and is not pushed here in the US, but is in the CF community in Europe. Read the Perricone Promise and start thinking of healthy ways to gain weight... CF diet is high in sugar and carbs which feeds bacteria (pseudo) and fungus (candida, aspergillus). I would love to help y'all get healthier with diet!! If you ever go to the cysticfibrosis com, I am dramamama. also, and this is something I have been wanting to tell you for a while (I have read your blog for months-I'm in Dallas and also a Christian), but I am on kalydeco and my pfts have gone from 1.31 liters to 1.57 in 14 days with no other treatments. It is working with my mutations (and Bennett's too)...:) I think so much of genetic expression has to do with diet and exercise and I 100% believe I am responding because I don't over-load my body with bad stuff. I created a blog a few days ago, but haven't posted anything. However, you can read my blog and posts on the cf site. Just catching up on your recent posts. As usual, you amaze me. Great information and explanations about the mutations. So hopeful for Bennett and Savannah. Exciting comments from "dramamama" above as well regarding Kalydeco!!! Keep up the great work! Breck - I want to hug you! Thank you so much for this, especially since Mackenzie also has that same combination of gene mutations. Angela Lynn was in town a couple of weeks ago and I mentioned your recap of the CFFVLC and she said she met you! Hi, just reading through your blog. It's been very useful to me and I wish you all the very best for the future. My newborn son has recently been diagnosed with CF (3 weeks ago) when he was 2 weeks old. Has the same exact mutations as Bennett does. Also had Meconium Ileus and had a recent surgery 30/09/2016) to put in a Stoma as part of an loop ileostomy procedure. Also lots of reasons to be optimistic with the triple combos in the pipeline for patients too from Vertex, Galapogos, Proteostasis etc which should help those with a F508 mutation even with a class I mutation as well. Lots of reasons to be optimistic.